How to add shapes to slides in C#? Shape is widely used on the presentation slides to make it more vivid and beautiful. 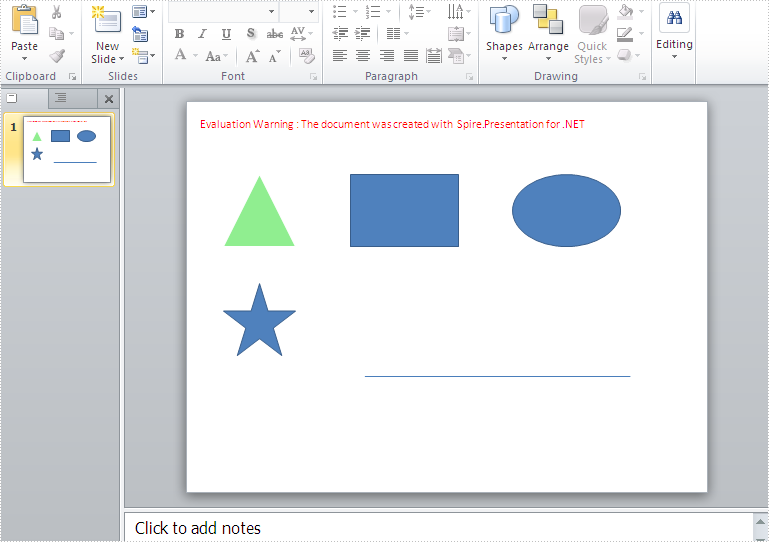 Spire.Presentation for .NET supports adding different kinds of shapes to the slides, such as triangle, rectangle, ellipse, star, line and so on. In this topic, we will show you how to add shapes and formatting these shapes to the slides in C#. Step 1: Create a PPT document. Step 2: Add shapes to the slides. Step 3: Apply some formatting on the shape. Step 4: Save and launch to view the PPTX document.